(Nanowerk Spotlight) Self-propelled motion of engineered nanomaterials can be useful in applications such as bottom-up assembly of structures, pattern formation, microfluidic diagnostic systems, or drug delivery at specific locations. While nature has perfected nano- and microscale motor systems, movement at the nanoscale is still a massively challenging problem for nanotechnology researchers. There are various approaches to creating self-powered micro- and nanosized motors and many researchers have focused on catalytic conversion of chemical to mechanical energy – a process that is ubiquitous in biology, powering such important and diverse processes as cell division, skeletal muscle movement, protein synthesis, and transport of cargo within cells (see: "Catalytic nanotransporters for nanotechnology applications outside biological systems"). Whereas the catalytic reactions of small molecules have been the focus of recent nanomotor research efforts, another form of self-powered motion in biological systems – polymerization, a process of reacting monomer molecules – has not attracted any interest. "Given the large repertoire of known organometallic polymerization catalysts, the design of polymerization-driven motors would considerably increase the scope of catalytic reactions that could be employed to power autonomous motion," Ayusman Sen, a professor at the Department of Chemistry at Pennsylvania State University, tells Nanowerk. "Furthermore, polymerization reactions offer the unique opportunity to both power motion and simultaneously allow the deposition of polymer along the motion track." In a paper in the August 30, 2011 online edition of Angewandte Chemie International ("A Polymerization-Powered Motor"), Sen and his group describe a new type of micromotor that is powered by a polymerization reaction and deposits tiny threads along its trail like a microspider. The synthetic motor system developed by the team consists of asymmetric gold-silica Janus microspheres (0.96 µm). Certain catalyst molecules (a Grubbs' ROMP catalyst) that catalyze polymerizations can be attached to the silicon dioxide surface of the Janus particles. Sen's team used norbornene as a monomer. The catalyst opens the rings and strings these monomers together into long chain molecules. As soon as the reaction begins, the spheres start driving through the surrounding norbornene solution. The explanation for this propulsion lies in the two different halves of the spheres. "The monomer is only consumed on the side where the catalyst molecules are present" explains Sen. "This causes the monomer concentration to decrease until it is lower than on the catalyst-free gold side. 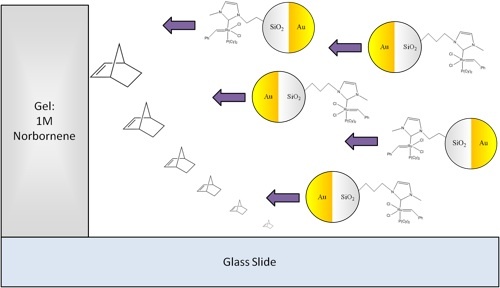 The resulting concentration gradient produces osmotic pressure, which causes a tiny current of solvent molecules toward areas with higher monomer concentration – toward the gold side. This miniature current drives the micromotor in the opposite direction." He points out that one of the defining features of living systems is their ability to sense and move up a fuel/food concentration gradient. "This phenomenon has very rarely been observed outside biological systems but can form the basis for the design of intelligent sensors that respond to information in the form of gradients," he says. "We successfully tested our polymerization motors for their ability to chemotax up a norbornene concentration gradient." This phenomenon of chemtaxis – by moving up the monomer gradient – allows the directed movement of the motor towards specific targets, and should permit the deposition of polymer along the motion track in a solvent in which the polymer is insoluble. In general sense a polymerization motor can be used to detect defects and cracks and repair them with a polymer. Sen points out that an even greater ability would be to use this kind of system in the body to fix damaged arteries or tissue. "However, the motor we present in our paper is simply a proof of concept and it will take more work to generate a system that can handle these problems," he says. "We also hope this work will inspire researchers in this field to continue exploring other types of mechanisms to create motion." Future research directions include the use of motors of this type that can be used as repair systems within the body. The major challenges include producing motors which are fast, move in a directional manner towards a specific target, while performing a useful task. For example a perfect version of a polymerization motor would be able to find damage in the human body, be able to get to the damaged site, use its power source to then repair the damage, and then move on. However, there is still a lot of research that needs to be done to meet these challenges.